Zerto’s IT Resilience Platform™ delivers disaster recovery, data protection, and workload mobility whether on-premises or to, from and between hybrid and multi-clouds. The platform is built on a foundation of continuous data protection (CDP) with built-in orchestration and automation providing IT leaders with simplicity, enterprise scale, and agile data protection to save time, resource, and costs. Zerto Analytics, with intelligent dashboards and live reports, provides complete visibility across multi-site and multi-cloud environments giving companies the confidence to know business SLAs and compliance needs are met. •Learn how Zerto 7 is changing the way backup is done; say goodbye to periodic backup! Old school backup is out! Today’s digital consumers demand an always-on level of service that backups simply cannot provide. Learn how continuous data protection is changing the way companies think about backup. 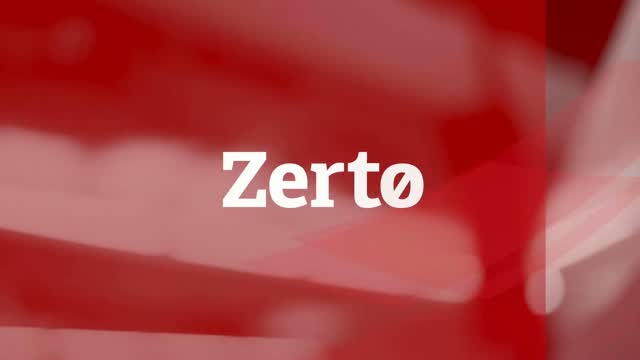 Listen in as Steve Blow, Technology Evangelist, explains Zerto’s vision for the future of backup and learn how continuous journal-based protection is disrupting legacy backup. The recently announced Zerto IT Resilience Platform™ converges backup, disaster recovery, and cloud mobility solutions into a single, simple, scalable platform. Continuous journal-based recovery gives you DVR-like abilities to rewind back and resume from any point in time to protect against logical & hardware failures, human mistakes, and natural disasters. Learn how to use the Zerto journal coupled with continuous replication to recover files, VM’s, applications or even entire data centers and resume from just seconds before an incident – no more wasting time manually restoring from backups, and your end users don’t have to settle for outdated copies of their files. Watch now to learn how journal-based recovery can help you move away from data loss and downtime. More than 90% of organizations are falling short of what is advised for IT resilience, setting up their digital transformation imperatives - and their business - to fail. Without a solid IT resilience foundation, organizations are at risk of disruption and data loss, jeopardizing customer loyalty, company valuation, reputation, productivity and employee morale. Join Zerto and featured speaker, Phil Goodwin, Research Director from IDC, to learn more about this exclusive study about what truly makes up a resilient organization. The holiday season is the busiest time for many industries… and their IT infrastructures. Transportation needs to get travelers to their destinations safely and on-time; retail volume explodes both online and in-stores as holiday-shoppers descend for the most profitable time of year; manufacturers are trying to keep up with demand. The list goes on. In the end, downtime is not acceptable during the holiday season (or any time of year) and all organizations can benefit from having an IT resilience plan in place. Listen in as Derek Adair, Cloud Architect, shows you how the Zerto IT Resilience Platform can prepare you for any disruption, planned or unplanned, or move your data for burst-capacity, and help you focus on a care-free holiday season. In this webinar, Forrester’s Senior Analyst, Naveen Chhabra, explores the practices and technologies that have evolved – far beyond old-school backup – to become the tech infrastructure needed to help organizations achieve true IT resilience and giving IT the tools they need so that they can focus on modernization and their cloud strategy. Old school backup is out! Zerto is changing the way companies do traditional backup with Continuous Data Protection. Learn more! Do you want to know how to get the most from the cloud? We've gathered our top 5 use-cases for the cloud to build a resilient foundation for your IT infrastructure. With the introduction of Zerto Virtual Replication 6.0, enterprises can now fully experience the true benefits that cloud technology has long promised. Listen in as Senior Vice President of Product, Rob Strechay reveals Zerto’s Game-changing technology so you can be ready to solve for cloud with a single solution.